I’ve just realised that I am a recovered addict! Over the last year I have managed to cure myself of my addiction to new gadgets. When I started my quest for productivity, I saw gadgets and tools as the answer, so it feels ironic that I have been lead away from them, I am a technologist after all! Gadgets can and do help, but not if they are over done. People who know me from my former years will remember that I definitely over did them! The problem with taking on new gadgets every month is that you never get productive with them; it also means that they never become a comfortable part of your routine. A new found focus on ‘a few good things’ has changed all of that. Using fewer tools means that you get to know the tools you have well and get good at using them. The interesting thing is that I have also settled on far simpler tools. Picking a few good things means that you focus on gadgets that endure, rather than gadgets that impress. My favourite productivity gadget these days is both an unusual and a common one. It is highly popular, but not for the reasons I use it. 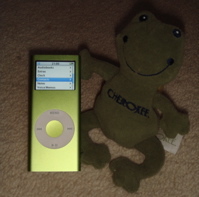 It is my trusty Apple iPod nano 4GB, recently acquired via ebay. Mine is very unfashionably green as you can see! These are all lesser known, less used, functions of the iPod, but ones it is very functional for. I keep it on me at all times, as it is exceptionally small and light, at about a tenth of the size and weight of the smallest PDA I have ever owned. In fact, it is so small that I hardly know it is there and I don’t need to carry as charger for it as the battery life is incredible. It doesn’t let me down on long trips, unlike my Windows Mobile PDA, and doesn’t clutter my bags with leads and chargers. In addition to all of that, with additional effort, it can store text notes, you can even fit the whole Bible on it! It also lets me keep up with the world and learn when I am on the move, as I use iTunes to sync the latest podcasts onto it. Thank you Apple for my best ever PDA. Apparently you can listen to music on it too, that sounds good! Aha…. Positive reasons for getting an iPod… Interesting! I have always focused on the music playing and storage facilities of a potential MP3 player, and then hesitated when confronted by my modest music collection. – Would it all fit in? – What quality would it be if it did all fit? – How long would it take to fit it all in? – When exactly would I listen to it? I keep just enough music and podcasts to get me through a few days commuting. I have two dynamic playlists in iTunes, one that has the most recently added albums and one that has the least-recently listened to tracks. That makes enough change to keep me interested and surprised as I travel too and from various work locations!